This one-day programme is aimed at those who need to know how to manage the stresses and pressures of the modern day working environment. Stress at work is a vicious circle – worry requires a lot of energy and achieves little thereby making the situation worse. Long term stress is not sustainable. Reducing stress can dramatically increase effectiveness. 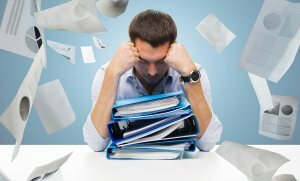 The programme deals with the sources of stress and how to identify them. Coping with high levels of constant pressure. How to manage yourself to get the best out of each day. The importance of a positive mental attitude and a high level of self confidence and the need to build in relaxation time. Within your control or beyond your control? This is one of our standard in-company programmes. It is a pragmatic programme. An in-company course is delivered to your people at a venue and date of your choice. Other in-company options include us developing a tailored or bespoke training for you. Please call 01608 644144 for details or use the enquiry form. "I thoroughly enjoyed the course, it was made relevant and meaningful by the tutors attention to our needs and his experience"